Growing up cream soda was a favorite of mine, but due to all the unnatural ingredients in most beverages, water is now my drink of choice on a daily basis. Recently I thought it would be fun to recreate my favorite childhood drink and turn it into something a bit more unadulterated. Experimenting with two types of vanilla from Nielsen Massey, I came up with the recipe below. Though both varieties I tried worked well I preferred the Tahitian Vanilla over the Madagascar for it's intense aromatic vanilla taste. One thing to note is that it is important to use seltzer vs club soda if you don't want any added sodium and/or potassium. Here's the fun part, Neilsen Massey has agreed to send one lucky reader a bottle of both their Tahitian & Madagascar Vanilla so you can try this recipe and decide for yourself which you like better. Enter below the recipe for a chance to win! Add the water and sugar to a small pot and bring to a simmer, continue to cook, stirring for an additional 3 minutes, or until all of the sugar has dissolved. Remove from heat, add vanilla, and allow to cool completely. Syrup can be kept in a jar in the refrigerator for up to 1 month. Add 1-2 tablespoons of the vanilla syrup to 8 ounces of seltzer water and stir to combine. Taste & add more syrup if needed. I love their vanilla! So cool you made your own cream soda!! We had dinner at a local microbrewery last night and my youngest son fell in love with their homemade cream soda. It would be such fun to make this in our own kitchen! Cream soda with a big scoop of vanilla ice cream. I'd love to make homemade vanilla ice cream, also homemade vanilla pudding!!! Yum! I've never made soda before, but what a great idea. I love cream soda, it's one of my favorites! No way! You blow my mind. I have got to make this. I love using vanilla in everything! This looks great! 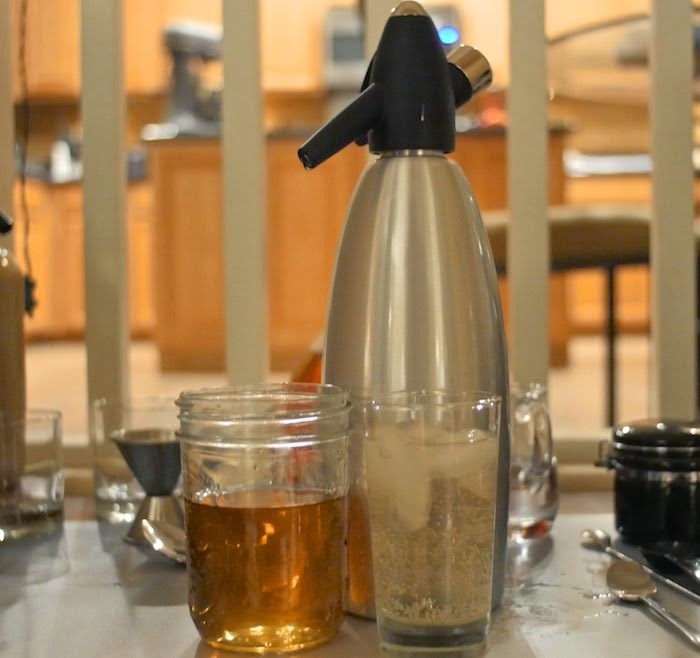 I have never made homemade cream soda and now I really want to try it out. I'd try making this soda of course! I love making my own soda! I have never tried cream soda but I'm so happy I now have a great syrup recipe. My kids all agree that cream soda is their favorite flavor of pop. I never thought to make my own. Silly me! I would definitely try this! I used to love cream soda. My best friend was a root beer fiend but I was always a cream soda girl. Totally digging these grown up sodas. Vanilla rocks my world. I would def have to make a Cream Soda! I've never made my own soda, how fun! This sounds fantastic - I have to admit that I have never had Vanilla soda and it sounds delicious. I would make vanilla custard and vanilla pudding to really highlight the true vanilla flavor. I follow foodhunter on instagram.com. I Love Nielsen Massey! They're one of my favorite Vanilla brands! My mom use to drink cream soda all of the time, Can't wait to make this for her! I would use it in cakes and pudding. I would love a nice vanilla coke. One of my favorite flavors! Would love to make my own cream soda! My son is a HUGE cream soda lover. He'd be so impressed if I would make this for him from scratch. Nice recipe! Thanks for sharing. I've actually NEVER had cream soda, do you believe it?! Since I'm such a coffee lover, I would make something coffee related. Cream soda has always been one of my favorites, too. This is such a fun idea! I never thought to make my own, it's my absolute favorite! I would use it for baking. I haven't had cream soda since I was a kid - love that you made your own. I'd use the vanilla in my baking. I seem to make a lot of brownies. Oh, I have always wanted to try making my own soda...cram soda is my favorite!! Nice! Yum, I love cream soda! Would love to make my own. I will start with vanilla ice cream ...and will use it in my cookies and cheesecake. I love this cream soda. I would make Ice cream or vanilla pudding! I'd love to make this cream soda, but I'd use the vanilla most in baked cookies. I'd make home made vanilla ice cream.